Priori Incantatem: Harry Potter Memories – Chapter Four: Rennervate! In the weeks preceding the release of a Harry Potter book, it was common for all plot details to be kept as hidden as critical state secrets. Whereas the movies were advertised by aiming for maximum possible exposure, the books always gained hype and notoriety for their clandestineness, for the immense amounts of speculation and conjecture that overwhelmed readers worldwide in the weeks before the launch of J.K. Rowling’s next Potter masterpiece. The title of the fifth book, Harry Potter and the Order of the Phoenix, may have been announced early, but that was as much information as we were ever given. Right up until the book’s June 21st, 2003 release date, I could only assume that the plot would revolve around Hogwarts getting a large shipment of immortal birds and lead to “Gremlins”-esque mayhem, with Dumbledore’s pet phoenix Fawkes serving as Gizmo. It is probably a good thing that this was the single least accurate prediction I have ever made, but I would still love to visit an alternate dimension where the plot reflected a much more literal interpretation of the title. But I would have to come back to our dimension eventually to read the real book once more, because ever since I first read it in 2003, I have revisited The Order of the Phoenix many times over. Seven years ago, it turned out to be an instant favorite, and though I don’t necessary think it is the best book from a critical standpoint, it may be the most compulsively re-readable, and forged many of my favorite memories of time spent at Hogwarts. As with Goblet of Fire, the hype leading up to Order of the Phoenix was unbelievable in its size and scope, though perhaps a bit more manageable since we had been through it all before. Fewer wild theories were circulated, probably because a real title was confirmed far in advance, and while we had again heard a major character would die, speculation was not quite as rampant three years after getting over the shock of Rowling’s first major-character murder. Yet even having experience with the hype, three long years of waiting had inflated our excitement and expectations to unprecedented levels. Nothing piqued our curiosities more than reports about the book’s length; not only would it total 870 pages, but would feature a reduced font size, wider margins, and thinner paper to conserve resources. Some found the idea daunting, others scoffed at the audacity of it, and die-hard fans like me grew giddy with anticipation. Could there be a better reward for three years of waiting than an extra-long book? I learned from the launches of prior books that the hype would always crescendo in the two weeks before release day, but this time, I didn’t get to experience that final stretch. The release had coincided with another important milestone in my life: My first Lack family fishing trip to Ontario. For over forty years now, the men in my extended family have all gone up to Big Pine Lake in Nestor Falls once every summer for a week of fishing. I had been hearing stories about the infamous trips from my Dad all my life, and in 2003, I was finally ten, the required age to go on the trip. Most of the guys could not make it that summer, so it wound up being just me and my Dad out on the boat. It was an extremely special trip, and the sense of wonder and discovery I had in learning to fish, exploring the now-familiar campsite, and simply being in a new country for the first time created wonderful lifelong memories. On June 20th, 2003, “Order-of-the-Phoenix-eve,” my Dad and I were driving back down from Canada, and had stopped for the night in Forest Lake, Minnesota. All the wonders of our fishing trip had distracted me for the past week, but the anticipation for the new book had now returned in full force. I simply could not wait any longer, and since we had driven by a Barnes and Noble on the way to our hotel, we decided it would be fun to go get the book at the midnight launch. Of course, neither of us had any experience with a midnight release, and I can now only shake my head at the doe-eyed audacity that allowed us to attempt such a thing. We arrived at midnight, well after the gargantuan lines had formed, and were told it would be at least three in the morning before we could get a book. Since we had a long drive the next morning, that simply would not cut it, and we returned, defeated, to the hotel. That night, I had a long, vivid dream about reading the new book, inventing a strange but somehow plausible page-turner of a storyline. The next day, the real, far superior version of the story would drive all details of the dream out of my memory. We rose early on June 21st and bought the book at the Forest Lake Wal-Mart; I can still recall the layout of that store, which remains the only Wal-Mart I have ever encountered to have a special, separate room for books. Most copies had broken bindings, perhaps not surprising given the book’s length, but after a little bit of searching through the hundreds of copies on hand, we finally found the perfect one, and I began reading mere minutes later. During the three-year hiatus, my reading skills had advanced considerably. Last time, with Goblet of Fire, I had read about half the book on my own and half with my parents over a two or three week period. Since then, I had ceased needing assistance reading and had conquered such classics as The Hobbit, The Lord of the Rings, and The Chronicles of Narnia. When Phoenix arrived, I was ready for the challenge, and devoured the entire book in just two days, most of that time spent in the car. When I finished, however, it did not feel like a mere two days had passed; instead, I felt as if I had just spent an entire year at Hogwarts, and I mean that in the best way possible. Some, including J.K. Rowling herself, have complained about the novel’s length. Nonsense. I know it sounds counterintuitive, but the excessive length is what makes this book great. Back when I read it for the first time, I felt that getting an 870 page Potter book after three years without any new material really was a dream come true. 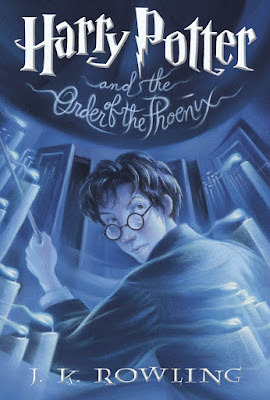 If the book had been poorly paced, or included sections of subpar quality, that obviously would not be the case, but Phoenix is the same literary gold Rowling had delivered four times previously. Now there was just a lot more of it, and I could not have possibly been happier. At the time I read it, though, I was only ten, a full five years younger than Harry was at this point in the story, so everything I got out of it was giddy escapism, mixed with lots of hero worship. Rowling’s world continued to expand and grow increasingly magical, so reading a Potter book and imagining life at Hogwarts had never been more fun, even though Delores Umbridge, the Ministry of Magic, and Lord Voldemort were making life a living hell for Harry. That Harry could live through these things and still be pure firmly established Harry as my go-to role model, which is what made the book such an incredible page-turner. At the time, I did not know that the main storyline – Harry’s formation of ‘Dumbledore’s Army,’ a secret Defense Against the Dark Arts league made in rebellion against an oppressive education regime – was metaphorical or had deeper meaning. All I knew was that I wanted to be as strong a person as Harry was when I turned fifteen, and therefore I hung on his every word and action. Phoenix does not end happily, with Sirius dead and Harry having learned, via the prophecy, that his life must either end in or involve murder. Yet the outlook is hopeful, because even after all this, Harry can still stand tall and face the next chapter in his life. That was the kind of person I wanted to be, the sort of friend I always wished to have. As strongly as it spoke to me as a ten year old, Phoenix has remained my favorite Potter book to revisit over and over because of how much new, meaningful material I discover when reading it again. As I neared the age of fifteen, I started to better understand and sympathize with Harry’s attraction to Cho, his brilliantly written teenage angst and mood swings, and his desire to rebel against oppression. I will never know why, but J.K. Rowling understands the mind of an adolescent boy better than any other author, and by the time I actually was fifteen, Order of the Phoenix had quite possibly become the most personally insightful work I’d ever read. At its heart, I think the novel is about one generation passing the torch to the next. The titular Order does not actually do much in the narrative, but Dumbledore’s Army does. The Order was founded by Dumbledore, hero of the first war with Voldemort, and Dumbledore’s Army by Harry, leader of the second. The book is all about Harry and his friends inheriting the future from those who came before them, something everyone experiences as they grow up and search for a path in life. Umbridge and the Ministry represent the very real adults in the world who refuse to accept generational shifts, the adults who grasp onto continually weakening vestiges of power by oppressing youth. This was not clear to me when I read the book at age ten; for starters, I had never met anyone like Umbridge. But by the time I was fifteen, and had gone through middle school, I realized exactly what Rowling was getting at: Sometimes, the stale attitudes of adults are indeed wrong, and the fresh, unique perspective of adolescence can be right, but the system often fails to give those kids a voice. Rowling’s solution? Kids must find that voice themselves and make it heard. This exemplifies why Rowling is one of my personal heroes. When I was fifteen, I felt frustrated at some of the adults in my life for legitimate reasons, but these people got to act malevolently because they had the power, never knowing whom they hurt in the process. During those times, reading Phoenix was a cathartic experience, as it was the rare work that understood and sympathized with what it felt like to be voiceless in a larger, age-based society. Most people dismiss teenagers, their thoughts, and their emotions as frivolous byproducts of hormones, but not Rowling. She treats the minds and emotions of young people with real respect and genuine insight, and that is why Phoenix has always been so near and dear to my heart. Reading Order of the Phoenix for the first time was a spectacular experience, but when it was over I returned to my ordinary, muggle life, which for the next year was devoid of new Potter material. The films had switched from an annual to an eighteen-month production cycle, so the next movie, “Harry Potter and the Prisoner of Azkaban,” did not arrive until June 4th, 2004. As fifth grade drew to a close, I naturally became very excited. The hype wasn’t as big as it had been for the first two films, and to have a Potter film released during the summer just felt unnatural, but I was nevertheless stoked. Of all the books up to that point, I was perhaps most excited to see a movie of Azkaban; what with Hogsmeade, the Dementors, the Shrieking Shack, and, of course, the time turner, the filmmakers had untold riches to draw from. The trailers looked incredible and the beautifully haunting poster, which showed the pale faces of the trio looking frightened in a snowy breeze, fascinated me. I knew, just from that image, that this movie was going to be different. A week or two before the film’s release, my Dad got tickets to an early screening of the film at the United Artists Denver Pavilions theatre, and instantly became my greatest hero. Seeing any movie early was a cool concept at the time, but the new Potter film? That was just too good to be true. The night finally arrived, and just as the previous films had done, the movie had a profound impact; but whereas the first two films influenced how I viewed movies, this one forever changed how I interpreted movies. My initial reaction was not ecstatic; I liked the movie a lot, but I did not fall in love with it as I had done with the Columbus films. I felt conflicted, because the movie was extremely different than the first two, and not nearly as accurate to the book. Still, part of me felt intensely affected after the movie was over, and when my Dad asked me what I thought on the car ride home, I told him that though it was different than the book, I did not mind, because its inaccuracies to the word of the book were made up for in the emotions. At the time, it was a thought I could scarcely convey, except to say that the film was powerfully emotional, more so than the first two movies. As I started to sort out my conflicted feelings, I realized that this was far more important than literal accuracy to the plot. It’s a value that’s grown to define how I look at movies over the past six years. Only one month after seeing “Prisoner of Azkaban,” I was officially promoted at the Colorado Kids to the rank of ‘CK Movie Kid,’ and thus started my career as a film critic. I began attending press screenings, seeing movies galore and writing more profusely than ever before. All the while, that strange feeling “Azkaban” gave me continued to resonate, and over the years grew into my core value as a film critic: The emotional impact of the movie is, and always shall be, a film’s single most important trait. One can praise or find fault with the directing, the acting, the music, the cinematography, or any individual element that goes into making a film, but if these aspects do not add up to something tangibly emotional, the word I used to describe “Azkaban” to my Dad, then nothing else matters, accuracy to the book be damned. Today, of course, my feelings on “Azkaban” have changed significantly. I am no longer ambivalent or conflicted about the film. It took a few years, but Alfonso Cuáron’s masterpiece adaptation is one of my all time favorite movies, and easily the best Potter flick of the bunch. I have written about it many times before, and I suspect I shall continue to discuss it, because it really is one of those landmark films that defines my identity as a critic. Looking back on my first experience with the movie, I am glad eleven-year-old me had moments of doubt while watching, because that doubt led to thoughtful reflection, without which I would not be the writer I am today. Sixth grade came and went without new Harry Potter books or films, and just like that, I was finally done with elementary school, hoping I could face the next chapter of my life with the bravery and integrity that Harry displayed at Hogwarts. Little did I know that, over the next two years, I was going to need a good book to lift my spirits like never before. Luckily, J.K. Rowling had just the right one for me, a tale of love, sacrifice, and betrayal in a time of war. It was time to meet the Half-Blood Prince. To be continued in Chapter Five: Wingardium Leviosa! The text of this article is taken from my 2012 book, Fade to Lack: A Critic’s Journey Through the World of Modern Film, available on Amazon and other online retailers.